Please measure the diameter of the post you wish to cover. Standard post sizes are generally 4",6",8"10",12". If you do not see a size for your particular post or are unsure please call us at 1-877-627-9264. We have a wide variety of color options to choose from. The most popular color is Yellow but we also have Red, Blue, Lime Green, Green, Beige, Brown, Orange, Black and White to choose from also. 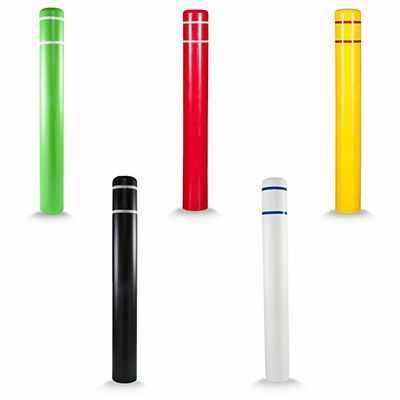 Our bollards have the option to have reflective tape colors added to the top to support with nighttime vision. You can select from White, Blue or Red to have added to your bollard. You can also select to have no tape color if you feel there is no need to have this feature added. Not only can you add reflective tape color to your bollard to ensure it can be seen at any time of the day but you can also choose the height it needs to be, our sizes range from 52" but can go as high as 72". So whatever the environment we have the right size set up for you.